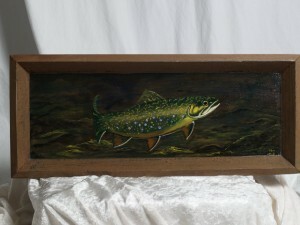 This tray has an original painting of a Brook Trout. The total size of the tray is 23.5″ wide by 10″ high. The painted area is approx. 20″ wide by 7″ high. Painting is acrylic on wood. This tray matches two others in our collection. The coordinating trays are of a Rainbow Trout on a wine colored tray and a Brown Trout on a black colored tray. The painted surface is protected with ten coats of polycrylic so the tray is completely functional without fear of damaging the underlying painting. This entry was posted in Trays. Bookmark the permalink.